So, there I was, on holiday in Nicaragua, held by two police men interrogating me about the contents of my pockets. 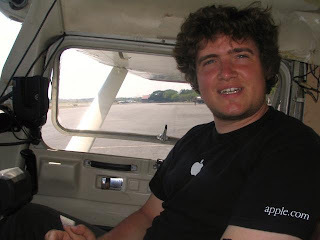 I was on holiday in Nicaragua, and actually found a pilot on the web: NicaNix, aka Steve. Steve's working here, and one of three guys that got their private pilot's license in Nicaragua in 2002 - the first PPLs issued in Nicaragua since the Sandinistas. His instructor was a Cap. 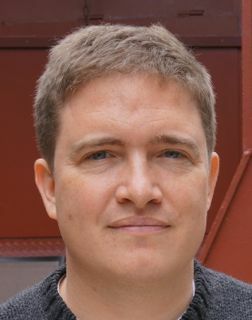 José Antonio Bonilla, who is running the Falcon Escuela de Aviación. So, I mailed Steve and asked whether he'd like to go for a ride and show me the local flying, and lo and behold, a few days later we do indeed meet at the airport of Managua. The machine was a Cessna 150. It has 400 lb useful load with full fuel, and Steve's, well, just over half that, and me too (at that time, I had been living in the US with all the concomitants), even without back pack. So, to save weight, I left the back pack in the "Oficina de Notificaciónes Aeronauticas" where we had previously submitted the flight plan. Then, because I hadn't got the pilot's license card yet (just passed my check ride a month ago), and left the temporary paper one at home, I had to go through the passenger terminal, not through the hangar - this is the international airport of the capital of the largest country in Central America, and security is strict. Steve went over to the hangar - he had to walk a mile, because his motorbike had just broken down - and preflighted, and drained some 5 gallons fuel (to compensate for our combined weight), and taxied the machine back to the passenger terminal, where I had gone through security and waited for him. The Cessna 150 has 100hp, one com radio, one nav radio, VOR, ADF, the usual six pack (turn co-ordinator was broken, though), carburator - though carb heat was rarely necessary: it was really hot. Steve communicated with ground ("Managua superficie, Yankee November - Charlie Golf Echo"), and we were good to taxi. Had to hold short ("Mantenga corto"), as there was traffic on approach. We squawked 1477. And then, off we went - short field take off. The runway is really long, but it was hot, and we were at max weight. So, 10 degrees flaps, rotation at 50, and airborne! We climbed at 70 knots, with some 200 ft/min. We flew south-east, to Grenada - beautiful. Mountains, volcanos, lakes (with fresh water sharks, apparently), islands, dense forest. Beautiful, but not so many options ("best field"?) for emergencies, so we turned back to Grenada, and then Steve let me fly: we did some maneuvering in the vicinity of the airport - steep turns, dutch rolls, etc. - I wanted to get a feeling for turn co-ordination on the 150. Rudders are sensitive on that machine. Then, we flew to one of his practice areas - Steve did some pattern work at Managua International in the course of his training, but obviously ATC doesn't like it very much, so most of it was done in a few airports in the vicinity. We headed to one of them, Las Lajenas. An asphalted strip, lots of gravel on the side of the runway and on one end. Flew over the numbers at 2000 ft, descended to pattern altitude while turning, flew over the departure end and joined right downwind for the active. A guy was walking on the runway. Pre-landing checklist, turn to base, turn to final, runway clear (finally), and I landed. Steve taxied back and did the take-off - it's tricky, can be very gusty. We first tried a no-flap takeoff, because of the cross wind, but the machine didn't climb at 60+ knots, with the nose fairly high, so Steve aborted the take-off. Taxied back, and took advantage of a lull in the wind to do a fully fledged short-field take off again: 10 degrees flaps, on the brakes, full throttle, roll. This time it worked beautifully. Back to Managua. Joined left downwind, and saw a jet and a regional carrier taxiing for take off. So, we talked to ATC and volunteered to extend downwind to let these guys go first - doesn't hurt to keep good will with ATC. So, we flew on and on downwind westward - along the shore of the lake, from the airport towards the city center. Finally clear to turn base - exactly over the old cathedral (one of Managua's major sights) and the presidential office! Great views, all along, but that was spectacular. Just a few days before, I was a sightseeing pedestrian down there. My landing on the big runway (about 8000 x 150 ft) was not quite as smooth as on the small strip (whose size was closer to Palo Alto KPAO that I am used to), we bounced a bit, but came to a smooth halt eventually. Anyway, so now we taxi back, and Steve drops me at the passenger terminal again and taxis to the hangar, and I just walk up to the terminal and wonder how to get through to the exit - we're supposed to meet on the road halfway between terminal and hangar. Well, turns out that the security guy there is not quite used to general aviation flights, and single passengers just dropping in coming from the runway. He asks my name, identification, what I am doing there, where I've been, and so forth. So, I tell him the truth: I am German, born in Argentina, doing my PhD in applied math in California, and have just been flying around with Steve, an American missionary friend in Nicaragua (who I have met three days ago on the internet) since I'm pilot too (but have forgotten my license at home, because I just got it in January, and haven't received the card yet), just for fun, and that I have no luggage since it is in the hotel, except for my backpack, which I am carrying because I've just returned from Little Corn Island this morning where I have taken diving classes, but the backpack is in the flight planning office, since we are too heavy for the plane, and my passport is there, too, and I only have my credit card and my German driver's license on me, and we have flown to Grenada, but not landed, but then landed somewhere else nearby with a guy on the runway, but I don't remember the name of that airport. All the while I am sitting there, big sunburn, bad haircut, unkempt (see the picture), T-shirt. PhD student and hobby pilot. At this point it occurs to me that I have read in the travel guide that Little Corn Island is well known for cocaine trafficking - sometimes when the police chases boats, the gangs would just dump the cocaine, and occasionally it just shows up on the beach there. Anyway. Meanwhile, for some reason, I am talking to two police men. They are very interested in my travels, whereabouts, drug habits, the contents of my pockets, enquired what the "Abundant Air Frequent Flyer card" is about (buy 10 chicken sandwiches, get one free at the airport cafe in Palo Alto) and why I have rolled up the 100 Cordoba note I am carrying. It rolled up itself, because it was in my jeans pocket all day on a humid island and several hours of boat and plane rides, I say, truthfully. And what have I been doing then with the rolled up bank note, they ask. At that point, I was getting a tad concerned here. Fortunately, I decided to call Steve on his mobile - I figure he must be done with taxiing, parking, shutdown, etc. He talks to the police man for a while, and after some back and forth their attitude changes, they give me back my wallet, cell phone, 100 cordoba note, 10-sandwiches-and-one-for-free-card, take me outside, pat me on the back, and say, "ah, si, bueno, Cap. José Antonio Bonilla, el es muy buen amigo mío". I offer to bring over my passport from the other office for them to check, but they say, no, no, all ok, Cap. José Antonio Bonilla, no problem. So there. 1.5 hours total flight duration, and landings in MNLL and MNMG! Thanks Steve, that was an awesome flight! MNMG-MNLL-MNMG: General aviation flying (or drug trafficking?) in Managua, Nicaragua was published on March 03, 2006 .